Commonly referred to as either the Shaggy Inkcap or the Lawyer's Wig, Coprinus comatus is a large and conspicuous edible (when young and fresh) fungus. It occurs in meadows, woods and roadside verges. 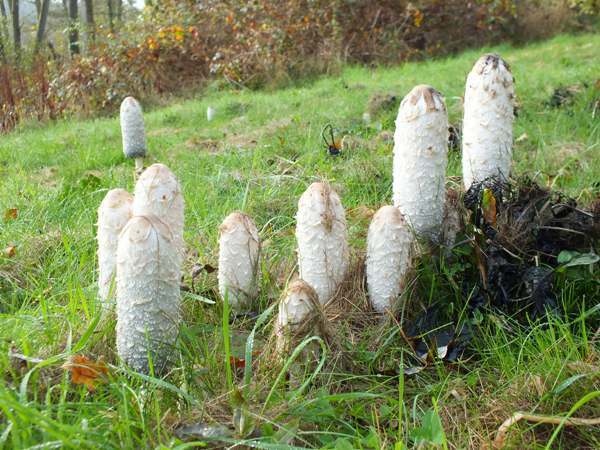 Now recognised as belonging to the family Agaricaceae, because it was the type species of the Coprinus genus it has taken that generic name with it. For this reason most other inkcaps now belong to the genera Coprinopsis, Coprinellus and Parasola, and they are all members of the family Psathyrellaceae. 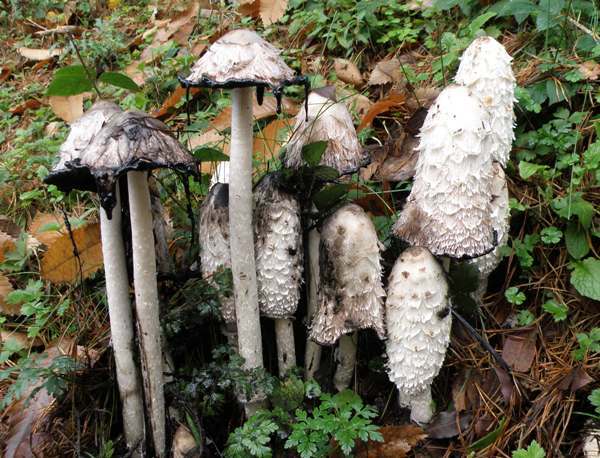 Widespread and common in Britain and Ireland, Coprinus comatus is also found throughout mainland Europe, from Scandinavia down to the southern edge of the Iberian Peninsula and the shores of the Mediterranean. It also occurs in North America. The Shaggy Inkcap was first formally described in 1780 by Danish biologist Otto Friedrich Müller (1730-1784), who named it Agaricus comatus. (Vast numbers of gilled fungi were dumped into the Agaricus genus in the early days of fungal taxonomy; most have since been moved to other genera leaving in the present-day Agaricus genus a much smaller number of gilled mushrooms that are sometimes referred to as the 'true mushrooms'.) Christiaan Hendrik Persoon transferred the Shaggy Inkcap, as Coprinus comatus, to its present genus in 1797. 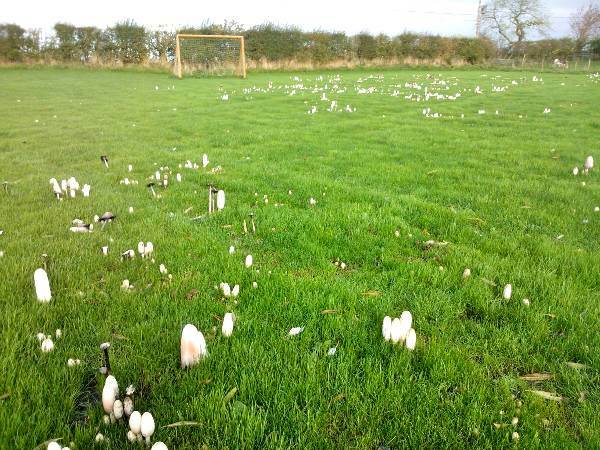 The picture above was taken by Paul Airey and shows a small field near Preston, Lancashire, England. The field had been previously used as a piggery before being treated with locally sourced compost, probably made mainly from horse manure; the land was then levelled, seeded with grass in spring 2012 and mowed regularly through the summer of 2013 until the autumn rains came. The unexpected result was Shaggy Inkcaps in their hundreds. Common names change with time and location. 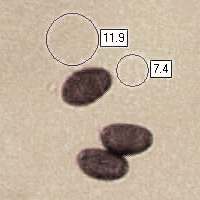 In America the terms Inky Cap or Inky-cap are most commonly used, while in many older field guides published in Britain you are likely to see Ink Cap or Ink-cap rather than Inkcap. 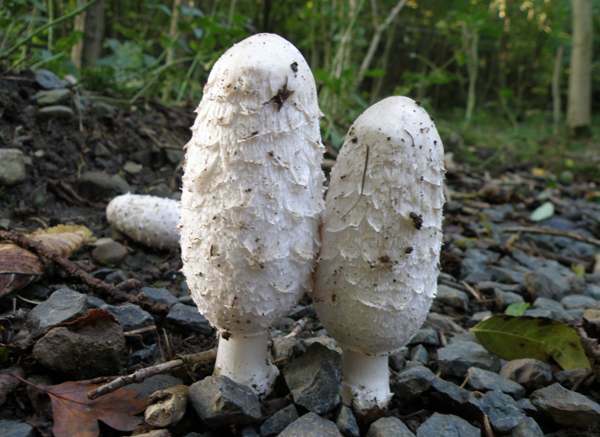 Lawyer's Wig and Shaggy Mane are common names used most often in the USA, whereas in Britain and Ireland Coprinus comatus is nearly always referred to as the Shaggy Inkcap or Shaggy Ink Cap. The generic name Coprinus means 'living on dung' - that's true of many of the inkcaps but not particularly apt for this species. The Shaggy Inkcaps in the picture above are growing through the gravel of a car park on a camping site in Cumbria. It is also a common occurrence to see trouping groups or long lines of these distinctive and stately mushrooms growing in woodland glades. The specific epithet comatus means hairy - a reference to the shaggy scales that stand out from the cap surface in all but the wettest of weather. Wandering through woodland or parkland at daybreak to gather the fresh young egg-shaped mushrooms is a good way of working up an appetite for a plate of mushrooms-on-toast. The Shaggy Inkcaps seen above show clearly the various stages of development and decay of the fruitbodies. If you are interested in these inkcaps from a culinary point of view, then it would have been much better if you had found them a day or two earlier. The Shaggy Inkcap is a much more common find than the so-called Common Inkcap, Coprinopsis atramentaria - demonstrating just how confusing common English names can be, even though the intention behind their very reason for existence is to make mushrooms a little less mysterious... what chance? 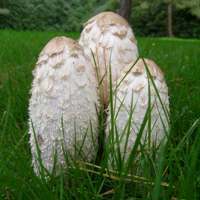 Initially egg-shaped and opening into a long bell, the shaggy caps of Coprinus comatus are at first pure white with a pale brown area at the top that breaks up into large recurved scales. In dry weather the whole of the cap breaks into pale flaking scales that stand out from the cap surface. Rain flattens the scales, as has happened in the case of the group shown here. 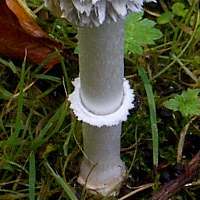 Typically 5 to 10cm but occasionally 15cm tall and up to 6cm in diameter, the white caps of the Shaggy Inkcap darken and deliquesce from the lower edge, eventually leaving just the stipe with a very small black disc perched on top. 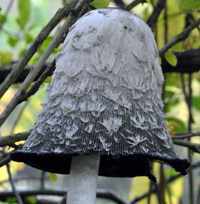 The adnexed to free gills of Coprinus comatus are crowded and initially white. They soon turn pink and then black before deliquescing (liquefying) from the outside edge. In this picture the gills have begun to deliquesce from the rim inwards, and in a few hours the mushroom will have been reduced to little more than a stem with a small inky disc perched on the top. The picture on the left was contributed by Chris Monks. The stem of the Shaggy Inkcap is parallel sided, 10 to 15mm diameter and up to 30cm tall; white, quite brittle, and hollow. 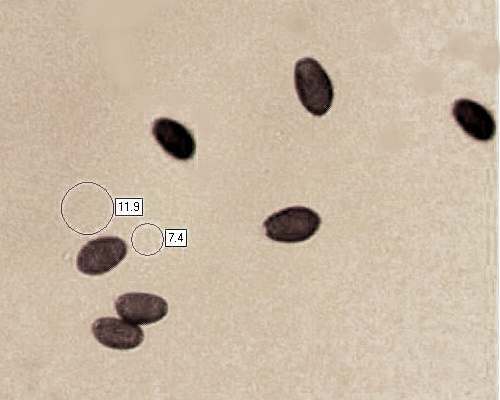 The stem ring becomes stained with black spores; it soon becomes movable and often falls down to the base of the stem. Ellipsoidal, smooth, 9-13 x 7-9.5µm; with a germ pore positioned centrally or slightly eccentrically. Faint and quite pleasant, but not distinctive. Saprobic; on grass verges and lawns, at the edges of footpaths, and in open woodland. Shaggy Inkcaps often appear in small groups and occasionally in long, wandering lines or fairy rings. April to November in Britain and Ireland, but most plentiful in summer and autumn; these edible inkcaps appear in greatest abundance soon after rain. In the early stages of fruitbody development, Coprinopsis picacea looks very similar to Coprinus comatus, but it is covered with tiny white scales which, as the cap turns grey and expands, stand out in distinct patches against a dark brown background to give it a 'magpie-like' appearance - hence its common name Magpie Inkcap. Although these mushrooms are more commonly seen in grassland and other open habitats, this line of Shaggy Inkcaps, part of a huge but incomplete fairy ring, appeared in a conifer plantation in Wiltshire, southern England. The Shaggy Inkcap is a good 'second division' edible species although lacking somewhat in flavour compared with Ceps, Morels or Chanterelles. It can be used to make soups or sauces to be served with meat dishes, or simply cut into strips and fried. The most important thing is to make absolutely sure that the fruitbodies you use are young and fresh, because as they age these fungi deliquesce and become an inedible sticky mess. Shaggy Inkcaps are an ideal 'breakfast mushroom', gathered when young and fresh and then cooked and eaten right away. It is important to consume these mushrooms within an hour or two of gathering them, as they deteriorate very quickly even if kept in a refrigerator.